It was a dark overcast morning in late September. We got up well before dawn and went over to Tebay to rouse one of our son’s friends, who had said he would help us to collect and move the cattle. He got into the car creaking and yawning and we drove to the field. It seemed at first as though all would go well. Our cows and calves were as usual lying in a small sub-group, a dark blob in the gloom, but well separated from the other beasts. We got them to their feet with care and walked them gently towards the gate, but just as Smithy opened it, one of the calves broke back, mooing. The cattle began to scatter, and we realised with sinking hearts that he was one of the other herd’s offspring. He had only just comprehended that, as his mother was not in this group, he was being abducted. Things rapidly disintegrated from that point. The cattle might stay out on their home pastures for another week or two depending on the amount of grass and the weather. Cattle do not seem to mind dry cold. But frost stops the grass growing, rain turns the ground into bog under heavy cloven hooves, and they soon get hungry, so they have to come indoors. It used to be thought that in medieval times all the cattle bar the breeding stock were slaughtered at Michaelmas, but it now seems that at least some of the calves and stirks were also brought indoors and fed. 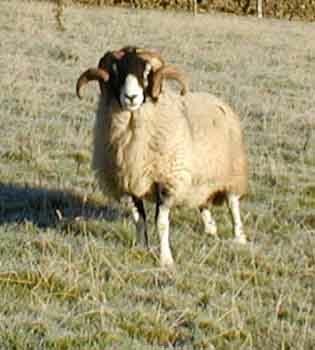 The ewes and rams (tups) are separated in late summer to prevent early lambs being born in the following year. The ewes are separated from this year's lambs, and put into poor pasture for a while. This helps to dry off any milk they may still have. Later they are allowed onto better going once more, and this combined with the shortening day length brings them into condition for breeding. Similarly with the tups, the daylength and some extra feeding help to get them into condition. The feeding also makes them keen to come to the shepherd, who will want to catch them and smear their chests with "raddle" - a coloured grease that is easily transferred from the tup onto the backs of the ewes. He will know which ewes have been served at what time by which tup. Then in the spring he will know roughly what lambs to expect and when. In the hills, the lambs are not wanted too early - April is soon enough. Sheep have a 5 month gestation, so the tups are loosed in early November.